A few years back, some of the Mozilla folks started doing NSID (no shaving in December) — it was a funny thing to do, especially for all hands meetings where you’d see a bunch of guys who had never really let their facial hair grow out — and the results were definitely not always pretty. Lots of scraggly beards, a few who were essentially indistinguishable from werewolves (“there, there wolf!”), and just generally lots of randomness. Was a fun thing to do, especially as more and more of us did it. Okay, so I know what you’re thinking: that’s a pretty righteous mustache! Not going to win any fashion contests, but not too shabby. 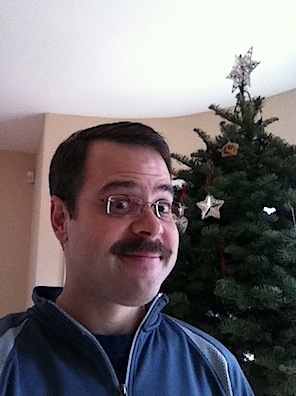 Or, perhaps, maybe you’re thinking what we were: surprisingly, I discovered that I look a little like Ned Flanders. 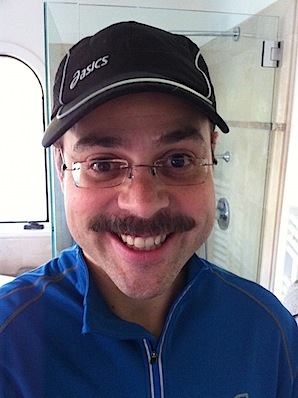 And an obvious signal that I should never, ever wear a mustache again. But I’m not really one to pay attention to signals, so in the spirit of blowing right through the stop sign, this year I decided to do it again. 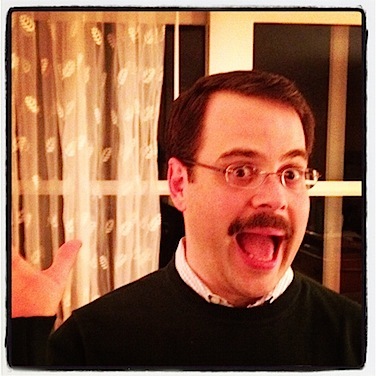 The theme of our New Year’s Eve party happened to be Comic Con, so it really just played right into my hands, and I went as Ned Flanders. First, it’s really hard to keep a straight face when you’ve got a mustache and are trying to talk with someone. Partly because you can’t actually believe it yourself, and partly because every 90 seconds or so they furrow their eyebrows, squint at you, then frown/grimace/laugh out loud. Pretty tough to take it seriously. Second, Ned Flanders turns out to be a little too subtle of a costume, strangely. Maybe I wasn’t yellow enough. Maybe it was because I had 8 fingers instead of 10. And, you know, maybe it’s because the Simpsons was cool about 15 years ago. (It was cool then, right?) Anyway, all the people I’m close to thought it was either right on the nose or hysterical. People who I’d recently met said all night long, and I’m not joking, “I didn’t know you had a mustache!” People at the party who didn’t know me assumed, I think, I was some sort of interloper with a weird vibe. But pretty strange reactions all around. I really had a good time doing it — I’m not usually a costume guy, so was fun to be someone else, even a nerd-diddly-erd, for a while.